I just received my eagerly-anticipated copy of the 2012 WRTH directly from the publisher and, as ever, jumped right into their articles and reviews. Like many radio listeners, I always look forward to the newest edition of the WRTH. It takes its rightful place at arm’s length next to my main receiver. Even though I use online frequency guides, I find they generally lack the detail and foresight that WRTH delivers. And much more than just a listing of frequencies, WRTH’s radio reviews, feature articles, and HF report make for excellent reading. On that note–this year, WRTH reviews several noteworthy shortwave receivers: the Alinco DX-R8E (the European version of the DX-R8T which we reviewed), the Reuter Elektronic RDR54C, WinRadio Excalibur Pro, Sangean ATS-909X and the Tecsun PL-660. They also take a look at the very affordable Pappradio DRM SDR receiver. The WRTH review mix always covers the receiver spectrum, from portables to professional, tabletops to SDRs. The 2012 WRTH edition also gives a simple primer on the terminology and techniques used for evaluating receiver performance–e.g., sensitivity, selectivity, dynamic range, etc.–a worthy reference for anyone who routinely reads radio reviews. I always enjoy their human-interest articles as well. In this edition they take us to the remote–I should say, most remote–Atlantic island, Tristan da Cunha; report on radio’s involvement (or lack of it) in the “Arab Spring;” and visit our good friends at Radio Bulgaria. 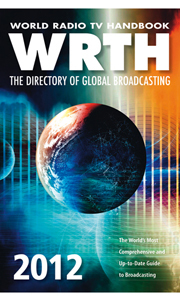 But, of course, the reason we all buy WRTH is for their in-depth comprehensive radio schedules for the upcoming year. How comprehensive are they? Check out the results from the annual comparative analysis of WRTH vs competitor guide Klingenfuss at the end of this post. Personally I can’t do without my WRTH–as I’ve often said, this indispensable go-to reference guide is the source for my shortwave listening fare. If you would like to know more about using WRTH’s schedules, please see one of our previous posts. “I still consider it useful, if the Handbooks also can provide the DX-er with additional information about Geographical Coordi-nates for his propagation calculations and Google Earth search, and ID in the language heard. Furthermore it is necessary to know current addresses (postal, e-mail and web) and QSL-policy for his reception report writing. For listeners with Broadband internet (ATDL) is it also useful to know, if the station broadcasts live audio on the web. Most of these useful details can be found in the WRTH, but they are still missing completely in the SWFG ! This fantastic result is down to the extremely hard work and dedication of all our country editors, contributors, monitors and, of course, the 3 main international sub editors who gather the majority of the information for the section. Without their enormous knowledge and skill, the section would not be what it is today. Finally we must not forget the publisher who has, amongst many other things, the unenviable job of doing the final setting and making it all fit into the available space – more difficult than it sounds, believe me!! Sean Gilbert – International Editor. This entry was posted in Books, Broadcasters, News and tagged Word Radio and TV Handbook 2012, World Radio and TV Handbook, WRTH, WRTH 2012 on January 5, 2012 by Thomas.